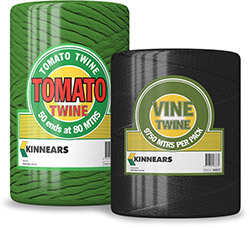 Tama Australia offer Kinnears tomato trellis and vine twine that is suitable for a range of plant tying and training applications. Kinnears Tomato Trellis Twine is conveniently packaged in easy to use pre-cut lengths, to assist the professional tomato producer. One measured cut provides 50 identical lengths. Manufactured by Tapex, Kinnears Tomato Trellis Twine is specifically formulated for Australian conditions.